Walking is fun, but you need to be safe while doing it. Follow these tips to make sure you get to and from school without any problems. • Walk with a friend when possible. • Ask your parents to help you pick a safe route to school; one that avoids dangers. • Stick to the route you picked with your parrents. • When you are near the street, don’t push, shove, or chase each other. • Never hitchhike or take rides from people not arranged by your parents. • Talk to your parents and teacher about any bullying that may happen during your walk. 1. Stop at the curb or edge of the street. 2. Look left, right, left and behind you and in front of you for traffic. 3. Wait until no traffic is coming and begin crossing. 4. Keep looking for traffic until you have finished crossing. 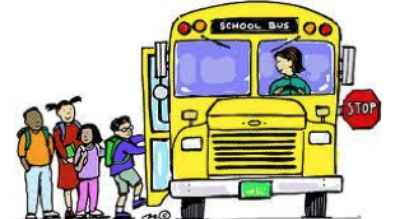 An Interdistrict Request is needed for students who live in our attendance area but wish to attend another district. To submit an Interdistrict Request, please go to the Education Service Center at 1200 N. Chester Ave., on the northeast corner of Ferguson and N. Chester. If you need more information, please call Stacy Nava at 392-2110 ext. 111.